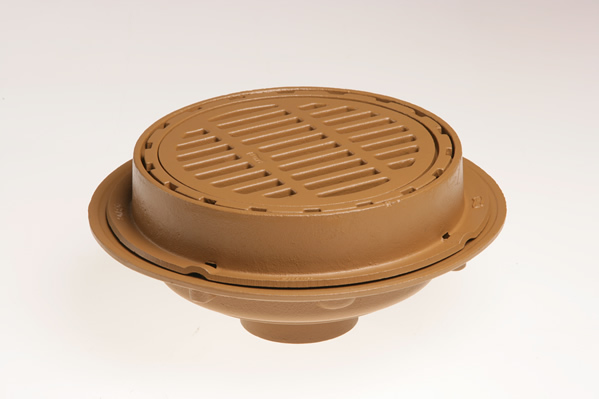 2230 Medium Duty Floor Drains with 12" Round Tops - Jay R. Smith MFG Co.
For general use where water contains solids or debris that must be intercepted. Large top is sued where high flows are anticipated. "Safe-Set" design insures bucket replacement after cleaning since top grate cannot be inserted unless bucket is in place. Duco Cast Iron Body and Flashing Collar with Cast Iron ADA Grate and Slotted Sediment Bucket. Smith No. 2230 cast iron drain with flashing collar and “Safe-Set” bucket and grate with nickel bronze top. Design to preclude grate installation without replacement of bucket. Smith No. 2235 for side outlet.